Back in April of 2007 super-producer Jerry Weintraub (Nashville, Ocean's Eleven, Twelve, and Thirteen, Karate Kid I, Karate Kid II) put his 6.63 acre ocean front estate in Malibu, CA on the market with an astronomical and truly breathtaking asking price of $75,000,000. The gated and secured property includes an 11,810 square foot main house with 7 bedrooms and 11 poopers plus two separate guest houses, fitness facility, two barns, stables, a north/south-aligned tennis court, swimming pool and spa and a private road down the bluff to the beach. With no takers the property was taken off the market and guess what kiddos, it's back on the market with a drastically and radically reduced asking price of $42,500,000. A few quick flicks of the well-worn beads of Your Mama's bejeweled abacus shows that's a stunning and staggering 43% discount from the original asking price. Whether a 43% discount is enough to scare up a big-bucks buyer remains to be seen but whatever someone pays it'll be a colossal windfall for Mister Weintraub who paid a mere $1,300,500 for the multi-parcel property back in the late 1970s and 80s. Actor John Krasinski (The Office) spent $921,500 in March of 2005 for a 1,279 square foot house in the Norma Triangle are of West Hollywood, CA. A few months later he flipped the 3 bedroom and 3 pooper residence back on the market where it languished for nearly 6 months before being de-listed. In September of 2009, Mister Krasinski re-listed the walled and gated Country English cottage with an asking price of $1,245,000. But Mister Krasinski–bless his fickle real estate heart–had the property de-listed again just two and a half months later. 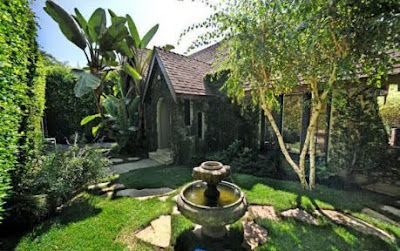 This week unlucky in real estate Mister Krasinski hoisted the little house back on the market with a much lower asking price of $945,000, a number that just might get the deal done. In the summer of 2009 Mister Krasinski and his then girlfriend now wife paid $1,857,000 for a privately situated house above the Sunset Strip. Back in early March of 2010 Your Mama heard through the Tinseltown celebrity real estate grapevine that he had that property quietly back on the market with an asking price of $2,195,000. Iffin we're being honest we'd confess that we don't really know if Mister and Missus Krasinski still have the house (quietly) up for sale but property records do reveal that the house is still owned by the cute couple. Hot-headed Oscar-winning actor Aussie actor Russell Crowe (Gladiator, A Beautiful Mind) and his wife Danielle Spencer have been on the hunt for a new family spread in the swank suburbs of Sydney (Australia) for quite some time. Way back in 2007 they (reportedly) had a looks see at Altona, a lavish waterfront manse in Point Piper then listed with a spine-tingling asking price of $50,000,000 (AUS). In 2009 they (reportedly) make an offer on the former French consulate called Le Manoir but they were edged out by international media heir Lachlan Murdoch–that would be Rupert's son–and his wife Sarah who paid a neck snapping $23,000,000 for the property. They next, in late December 2010, (allegedly) took a shine to the huge and hulking Headingly House, the family seat of former ambassador to France John Spender and his ex-ladee-mate, Italian born Australian fashion designer Carla Zampatti. There were multiple reports that Mister and Missus Crowe were thisclose to closing on the posh property but, alas, that purchase never came to fruition. Now all the Australian tabs and news outlets such as the Sydney Morning Herald are reporting the Mister and Missus Crowe finally settled on and purchased an estate with the unfortunate name of Te Puke (pronounced teh-pook-eh", a 1909 mansion with a 1927 Arts and Crafts style second floor in ritzy Rose Bay for which they paid ten million Australian buckaroos, an amount that Your Mama's currency conversion contraption shows converts to just about ten million American dollars. 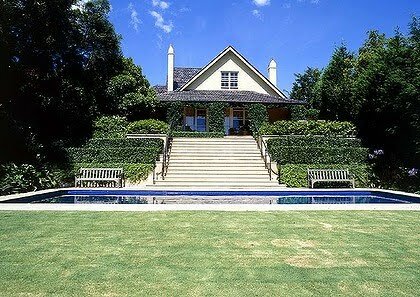 The house overlooks the fairways of the Royal Sydney Golf Club and is reported to have six bedrooms. As far as we know Mister and Missus Crowe still own a $14,000,000 penthouse pad at Woolloomooloo's Finger Wharf in Sydney and an 800-ish acre rural spread in Nana Glen–about 350 miles north of Sydney–where the couple got hitched in a chapel he had built on the grounds. Honestly, I will never understand California real estate. It makes me want to laugh AND cry. $75M? LOL!! For the opportunity to be swallowed up by an earthquake or tsunami at some point? Too funny. Malibu ain't nothing special. Water's too damn cold and it looks like every other beach on earth. I'll take a cheaper house on the beach in Florida or Alabama over Malibu any day. I think Russel needs to have a christening party and start calling 'te puke' something new. It's a historical house, but not exactly Monticello so I don't see a problem changing the moniker. Mish Mash on a Tuesday? What a lovely mid-week treat. 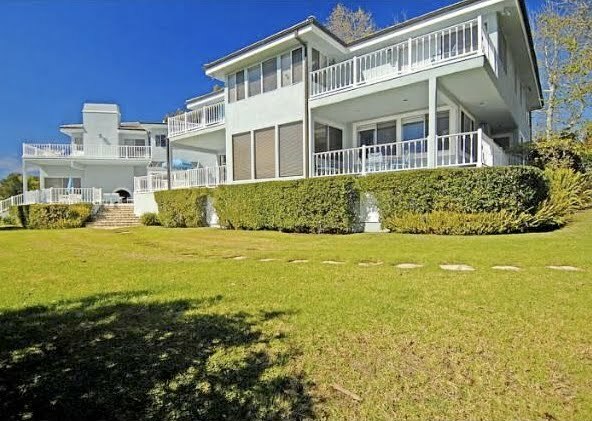 1) As far as the Malibu property is concerned, located on the bluffs east of Point Dume, it's a great location, lots of land and some great amenities wrapped in "meh" architecture. My guess is anyone who can cough up near 40 million clams can afford to either remodel or subdivide and/or develop. 2) Krasinski looks like a wannabe flipper who has terrible timing; both properties are salvageable, but have serious drawbacks; the Norma Triangle house has a low rise (but bulky) apartment house looming over it across the street, and the other property is up behind the Chateau Marmont on a flag lot squeezed up against a hillside. IMHO that would make them hard to move in this economy without an earthquake. 3) Crowe acts like a wannabe flipper/windowshopper as none of these houses seem to have much in common (which I'd expect if they're looking for a place to raise the kids) other than being in the general area of tony neighborhoods near Bate Bay. As for the Kent Road property (on a mean little 1200 sq. meter wedge of turf) they supposedly settled on, well, it does overlook a (sliver of) golf course, and it is closest to the water. Come to think of it, they all do seem to have one thing in common ––– big, rambling and definitely not new construction; what's that about? Anonymous 1:35, I feel the same way about NY City real estate. I can't believe people pay tens of millions of dollars to reside in a dark gray box with no yard and people living directly above and below them in a noisy and filthy city. For millions less you can get a much larger, infinitely more beautiful ranch house with many acres of stunning land, clean air, privacy if you so desire in a place with a hell of a lot less crime. As bad as Malibu real estate is, the bigger joke by far is NYC real estate. 1:35 how right you are. The water is frigid and also at times filled with stinging jellyfish. Swimming is hopeless. And the houses are scrunched together just as in Bel Air, etc. It is quite amazing how stupid people become when they get into a crowd where everybody has to mimic the others. Tinseltown denizens don't really know what elegance and luxury are. I love how people compare living in Southern California to living in Florida/Alabama. You're comparing apples & oranges. Same goes for NYC, it's a world capital/alpha world city. No other city in America is in the same league. I'd take NYC over any other part of America. Is the Weintraub property far from the Max Palevsky estate? Don't know the area but I notice a pier in the background of each property. This is great! I am going to recommend this to all of my clients. Thanks for the informative post.